Terra cotta flower pots make a bright and cheery pot for your favorite plants or whatever you want to use them for. I have mine sitting on my patio table with my favorite flowers. In the winter I put artificial flowers or greenery in them so my patio still looks cheery. You can use just about anything you would like to decorate your terra cotta pots. Try using fabric, wallpaper, wrapping paper, old greeting cards or even making it patriotic. I used seed packets for mine. You could even use travel brochures that you have picked up in your travels or even places that you would like to go. There are so many possibilities that you can use to decorate your pot. Cut out the seed packets with your decorative scissors. Arrange them on the pots in the design you want. Overlap them and some you will need to cut them to fit. Paint the back of the packets with the mod podge and put them on the pot. When you have the pot covered with the packets then coat the entire outside with decoupage and let dry. Using the decoupage, attach the sunflower seeds. When dry, paint the entire outside with 1 more coat of decoupage and allow to dry. You now have a finished terra cotta flower pot. These terra cotta flower pots really look nice when you use material like you would a quilt. Cut different shapes and colors and cover the entire outside. 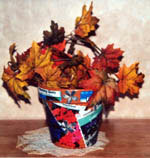 Patriotic pots can be done in red, white and blue material with stars and strips. I hope you have as much fun making these decoupage flower pots as I have. Just go wild and see what you come up with.